Now let's take a closeup look at some of the features and components that make up the Primo Oval XL 400. Let's start with the top vent. It's made from powder-coated cast iron. You'll notice that there is no handle and that's because it isn't intended to be removed during cooking. As you can see below, the top of the cooker has gasket material to hold the top vent in place. You don't need to take the top vent off for high-temperature cooking because the opening of the top of the cooker is about the same size as the opening of the top vent. Opening the slider gives you just about the maximum vent opening possible. We were able to get the Primo Oval to just over 800°F with this arrangement, so there really is no need to remove the top vent for airflow reasons. However, we will mention that after 13+ years of using cookers with removable top vents, we do occasionally like to look down the vent into the cooker rather than open the cooker's lid. Having a gasket and making the top vent not easily removable is most likely a decision that was made to make sure the top won't fall off when you open the lid. It's not a big deal, be we do miss the ability to remove the top vent during cooking. As you can see in the third photo below, the slider tension is controlled by a spring-loaded screw which requires a hex key to adjust it (although you can adjust it with your fingers with a good grip). The slider itself won't move when you raise the lid if the tension is properly adjusted. Also, the spinning part of the top vent is held on by a screw, but you cannot adjust the tension of it. The spinning part of the vent will turn freely regardless of how you tighten the screw. In general, though, if you open and close the lid with a modicum of restraint, you should find that the slider and the wheel don't move. A few more words about the top vent: The vent will close tightly enough to snuff out the fire when you are done cooking. Also, the top vent is not watertight. During a rain, water can get into the cooker. It is highly recommended that you buy a cover and use it on your cooker when you aren't cooking. Also, if you really want to, a ceramic rain cap from a large Big Green Egg cooker will just fit over the gasket material and provide an air- and water-proof seal for the top of your cooker. Next, on to the thermometer. The thermometer we received is new and a big improvement over the previous thermometer. It has a large 3½ x 2-inch oval dial (approximately 50% larger than the previous thermometer) and a range of 0-750°F. It is easily visible from some distance. The thermometer is adjustable, whereas the previous thermometer was not. However, the adjustment mechanism is not the usual nut on the back of the dial that we see so often. There is a small slot on the end of the thermometer's probe. A small flat blade screwdriver and be used to turn the end of the probe to calibrate the thermometer. You can see this slot in the photo below of the thermometer probe. Now, on to the inside of the cooker. There is a fire box, a ceramic plate, a fire grate and the cooking grids. As you can see in the first photo, the firebox has no accompanying fire ring. The fire box is made to be the right height so that the cooking grids are roughly level with the cooker opening. You can also see in the first photo, the ceramic plate which sits on the floor of the cooker. Next comes the fire grate, and finally the cooking grids are shown in place. Below you can see a closer photo of the ceramic plate which sits on the floor of the cooker. Due to the unique oval shape of the cooker, the shell is subjected to uneven heating at times which can place uneven stresses on it. The walls of the shell are protected by the walls of the firebox. The floor of the shell is protected by this ceramic plate, so don't forget to use it. On the right below is a photo of the cast iron fire grate. The fire grate holds the burning charcoal up off the floor of the cooker, and allows air to flow from the bottom vent up through the fire and into the cooking chamber. You can see the small fingers in the center of the top of the grate. These hold the firebox divider, an optional accessory that we will show later. The openings in the fire grate appear to be adequately sized to minimize chips of charcoal getting caught in a hole and blocking airflow. After several months of using this cooker, we can't say that we've seen any blockage occurring. Next let us look at the cooking grates. There are two grates, one for each half of the cooker. They are made from porcelain coated steel. As you can see in the photos, they have legs that rest on the firebox and raise the grates up about even with the cooker opening. Now for some cooking grate dimensions. The individual rods are 7/32-inch in diameter. The space between rods is 11/32-inch, thus they are on 9/16-inch centers. The overall size of each grate is approximately 12½ x 18¾ inches so when placed in the cooker side by side, they provide an oval cooking surface 25 x 18¾ inches. As you can see in the center photo above, the last rod on the end of the grate leaves space for fingers or tools to grip the grate. If you measure the distance between those two end rods, the distance is 23¼ inches. Also you can see that the grates are raised above the firebox by a set of three legs. When we placed the grates on a flat surface, the height of the grates is 2-7/16 inches above the firebox in the center and 2-3/16 inches on the ends, thus there is an ever so slight slope from the center to the ends. You can, of course, turn the grates upside down if you like to get them closer to the fire. The grates are reversible. You can turn them over and use them "feet up" which places the food 2 inches closer to the fire and provides more "headroom" for items such as larger Dutch oven. Finally, if you calculate the surface area of the cooking surface, you essentially have a circle of radius 9&frac38; inches and a rectangle that is 18¾ inches by 6¼ inches. If you do the math, that all adds up to 393 square inches. Close enough! Our cooker had two types of gaskets installed. The first, of course, lines the edges of the top and bottom shells of the cooker. It is made from a Nomex type of material. The second goes around the chimney and helps seal the top vent to the top of the the cooker. It is made from a more traditional felt-like material. Cookers being manufactured now have only the Nomex-like material used for both gaskets. Some cookers still in the pipeline may have the older felt-like material on the chimney, but eventually all new cookers will have only the newer material. If your cooker has the older gasket material, you can order a replacement gasket kit from a Primo Dealer. If they don't have them, you can contact Primo directly. We have used the cooker about dozen time so far and the gaskets that line the edges of the dome and base look essentially brand new. So, with appropriate care, they should last quite a while. The top vent is powder coated cast iron. The grids are porcelain coated steel. The hinge, bands and the handle are all powder coated steel. The bottom vent is 304 stainless steel. So, a bit more on comparing the Primo OVal XL 400 hinge to the BGE XL hinge. As you can see in the photos below, the Primo hinge is one big sturdy assembly with the advantage that there is really no opportunity for the hinge to get out of adjustment. 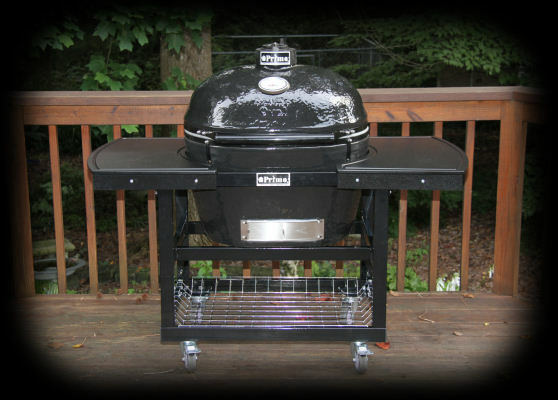 The BGE XL hinge is actually four assemblies; two hinges and two springs that all bolt on the bands that hold the base and lid. The advantage is that the opening action is a sort of compound "slide and raise" motion that gives you a slightly "lighter" lid. The downside is that you have four components that have to be tight and in adjustment for the lid to operate properly. If things aren't kept tight and in adjustment, the lid's movement is somewhat sloppy and wobbly. It should be noted that Primo currently is testing a new design that will eliminate the need for these short bands. As you can see in the photo on the left, the bands are held tight by bolts. You tighten these bolts until they bend as shown. These bolts are special bolts that are of sufficient hardness that the threads do not strip out when tightened. Other bolts that you might pick up at a hardware store may break or strip when tightened. If you ever find the need to replace the bolt, you should check with either your dealer or Primo to make sure you get a bolt of sufficient quality. The center photo above shows one of the two short vertical bands that are on either side of the handle. These short bands are there to prevent the lower band from popping off, sending the whole lid, bands and hinge assembly backwards over the cooker. They are an extra bit of insurance in the event that you neglect to keep the bolts holding the bands on tight. These bands are exclusive to the Oval XL 400. At present, they are not used on the JR 200 or the LG 300 cookers. The handle is made from powder coated steel, sturdy and solid, easy to grip. It is about 16½ inches long and 1¼ inches in diameter. One additional word about the current handle. There are two holes in the back of the handle, facing the cooker. They are there as they are necessary for the powder coating process. If you leave your cooker out in a substantial rain, believe it or not, water will enter the holes and sit inside the handle. This will produce some rust inside the handle. When you open the lid, orange rusty water will drip out of the holes. Primo has indicated to us that they will be moving the location of the holes to prevent this. If you have a cooker with the holes at the back of the handle, however, we'd recommend either keep the cooker covered when it rains or perhaps covering or plugging the holes. There is no spark screen so you do need to keep watch for sparks and embers coming out the lower vent. We have seen sparks and embers exit the lower vent on our large Big Green Egg and see no reason why it might not happen with this cooker also.